Who Do They Really Work For? Has a special agreement with the insurance company to work at discounted prices, in return for future work. This arrangement can create a conflict of interest. Goal is to reduce costs for insurance company, in return, promised additional work. Scope of work needed is dictated by the insurance company's cost expectation. Preset industry formula states structures should take only 3 to 5 days to dry properly, regardless of conditions and materials. An independent contractor works for the policy holder and is not influenced by the insurance company’s containment practices. Objective is to do whatever is necessary to do the job right. Goal is to return structure to pre-loss condition at a reasonable and fair cost. Scope of work needed is dictated by science, third party validated site data, and IICRC standards. Conditions and materials are taken into account, amount of drying time determined by moisture content readings. A Mission Viejo couple is suing State Farm Insurance and two other preferred vendors after they say the companies neglected to properly take care of their home after water damage. They were told the structure was dry, but two weeks later they started to smell mold in their home. What happened next was a nightmare for the homeowners. Learn the facts before you hire a company to do your restoration. Note: ABC's 30 Second Commercial will play at beginning. Should I Use a Preferred Vendor? While it may be tempting to use an insurance company's preferred vendor - who do they really work for? You or the insurance company? Are they more concerned about returning your structure to a pre-loss condition, or preserving their relationship with the insurance company in order to get more job referrals? Yes, you can choose your own restoration contractor. A qualified independent contractor will provide everything the insurance company needs but their loyalties are to the property owner. A competent restoration contractor will document the damage, provide a scope of work, test results. At NextGen we handle everything for the policy holder, and meet with your adjuster to go over every step of the process. Why do Insurance Companies have Preferred Vendor Programs? Simple, the insurance company keeps a preferred vendor program for one reason only - to save money. On average, claims double, triple or even quadruple once an independent and competent restorer is on the project. Not because the independent contractor is dishonest, on the contrary, because they have the skill to find all the damages and the resolve that the preferred vendor lacks to bring them to the carriers attention. These preferred vendors operate on the inside of the insurance companies trust and in exchange, control the amount of the loss otherwise known as the loss severity. But is that a contractor's job - to ensure profitability for an insurance company? No, it is their job to find all of the required work to make the insured hole and represent it fairly to the carrier. This makes many ask, who does the preferred vendor really work for? 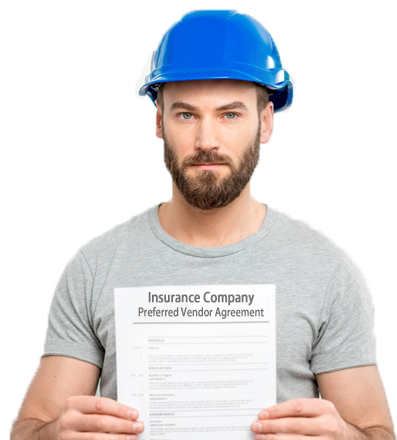 What Happens if a Preferred Vendor Disagrees with the Insurance Company? While some preferred vendors may indeed be very ethical, to do so increases what the carrier pays and ultimately will get them removed from the program. Just ask us, we know the companies across the United States that as they have become committed towards serving and insured interest, they have lost all of their preferred vendor relationships. Is this correct, Our Insurance Company Claims Structures are Dry in 3 Days? The problem? Insurance companies use a preset formula to determine how much equipment and how many days they will "allow" a structure to be dried. If you are using a preferred vendor they will be required to follow this protocol. The amount of drying time is determined only by monitoring the moisture content of the materials and advanced testing. Again, this is where an independent contractor will be able to show the data and act accordingly. Over 95% of structures are wet enough to support mold growth. If you had a contractor restore your property and you now smell mold, we can help. We specialize in re-inspections and peer reviews.